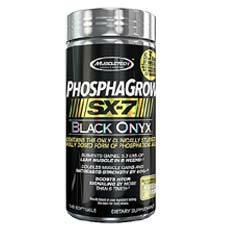 PhosphaGrow SX-7 - Does PhosphaGrow SX-7 Work to Build Muscle? For the truly serious bodybuilder the most important thing that you can ask for is that you are squeezing each and every ounce of benefit out of each and every workout and recovery period. When one steps back and looks at all of the sweat equity and mental determination that you put into attaining the body of a god, there is little point in making maximizing the benefit from everything that you do from the planning of each workout to the length of the recovery period to knowing about and caring about each thing you put in to your body to provide you with the fuel for this quest. And part that quest means paying attention to the kinds of supplements that you require and which of the many specific formulas are the best of the best. So, like everything else in this world the devil is always in the details. Knowing all of that, let's go over a few of the basic reasons why it is that you need a supplement. The first and foremost reason that you need a high quality supplement to gain every ounce of benefit from your training but, as a true competitor you need one to make sure that you are taking every advantage that your competitors are taking because, in the world as it really exists, no one can truly compete unless they are competing on every level. With all of this in mind and as part of our ongoing efforts to help our readers work their way through the maze-like forest of bodybuilding supplements we have decided to take a long hard look at one of the most talked about bodybuilding supplements available on the market today - it's called PhosphaGrow SX-7. Produced and distributed by a company called MuscleTech which came into existence in 1995 when they launched one of their original offerings which was a creatine and carbohydrate supplement called Cell-Tech, PhosphaGrow SX-7 Black Onyx owes its popularity largely to the fact that the company has a well-devised marketing strategy and highly informative and content rich website. The key claim made about this product is that it acts as a catalyst to fast lean muscle growth by infusing the growth process with a highly valuable and too often overlooked element in the form of Phosphatidic Acid which is crucial to the process of building muscle building but is also produced in far too limited supply by the body's natural processes. By combining with mTOR on a chemical basis, this highly necessary acid bolsters the body's capacity to speed up the transfer of electrical signals which help to provide the catalyst for the growth of large amounts of lean muscle mass through anabolic activity. Looking at studies which were performed at the University of Florida, the company claims that multiple categories of measurable muscle growth rates performed at fifty percent or higher among the users of PhosphaGrow SX-7 than with subjects who were given only a placebo. Another listing of additional ingredients includes monoglyceride, and diglycerides, medium chain triglyceride oil, from medium chain triglycerides, gelatin, glycerin, silicon dioxide, caramel color and purified water. Although Many products tend to user testimonials and user reviews as a marketing tool it is a well-known fact that these testimonials and reviews are somewhat tainted by bias since it is the company that authorizes their use on official websites and other promotional material which is controlled by the company which is unlikely to use any statements that are less than glowingly positive. This being the case we tend to look for alternative sources of user reviews that would not be controlled by the producer. Looking at multiple industry related websites and internet chat rooms dedicated to the subject and with no apparent affiliation with PhosphaGrow SX-7 we discovered many independent user reviews. Looking at them in total it seems clear that the vast majority of them were highly negative in nature. The most common thread running through the negative reviews was simply that the product did not deliver on its claims in any meaningful way. There are multiple websites offering this product to consumers in multiple languages but consumers in the US will find it offered at $99.99 for a pack of 140 capsules. The included Instructions suggest that users should take five capsules per day about thirty minutes prior to a day's workout. Taking into account the ingredients used in the manufacture of PhosphaGrow SX-7 it does not appear that there would be an any significant medical concerns or side effects associated with the normal use of this product. However, it is always recommended that anyone, including those with certain conditions seek the advice of a physician or other qualified medical professional before starting to use this product. When one steps back to look at it, the one thing that any truly serious bodybuilder will tell anyone is that the most critical thing they reach for is a way to maximize the benefits they get from each and every workout session and recovery period that they do. They are also likely to tell you that the one thing they have likely discovered along the long and uphill climb of a road that they are traveling on in this endeavor is that those who fail in their quest for the body of a god all have one thing in common - they failed to acquire all of the needed tools necessary to provide the development processes of their body every possible advantage it needed to succeed. Ultimately, this means that it is not enough to have the greatest possible workout regimen, strategy for rest and a stupendous diet. One must also pay great attention to the even the smallest of details including which supplements will likely contribute to achieving the maximum benefits. A close look at PhosphaGrow SX-7 shows that there are many positives that illustrate how this product and the company that manufactures it deserve to be among the most serious contenders such as the clinical research that offer information backing the concept behind the modern formulation. However, a closer look shows that there are even more problem areas based on the lack of information related to its ingredient list, the pricing and, more importantly, the overwhelming evidence from large number of negative user reviews found on independent websites and dedicated chat rooms. In the final analysis, when one stands PhosphaGrow SX-7 up against the best examples of what the muscle growth industry is offering at this point in time it seems clear that this product has failed to match their quality in the most critical areas. For more information regarding the highest quality, top-ranked bodybuilding supplements available on the market today, click here.